Enter into the Yoplait Go-GURT Game Night Sweepstakes now through December 23, 2018 for your chance to win 1 of 1,500 $20.00 to the Nintendo eShop to make family game night, even cooler. All you have do is visit their social media pages: Facebook.com/gogurt or Instagram.com/gogurt then comment on Sweepstakes post using the hashtag the #GoGurtGameNightSweepstakes to receive one (1) entry. How To Enter: Go to this link:yoplait.com/gamenight during the sweepstakes period and follow the online instructions to register by entering all information requested on the registration form and once you filled out the entry form. Prizes: Phase 1: 750 Prizes will be awarded. Each prize is one (1) $20.00 Nintendo eShop Card. Approximate Retail Value (“ARV”) of each prize is $20.00. Phase 2: 750 Prizes will be awarded. 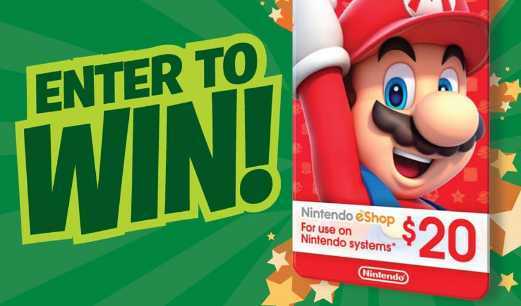 Each prize is one (1) $20.00 Nintendo eShop Card. Approximate Retail Value (“ARV”) of each prize is $20.00. When To Enter: This sweepstakes entry begins at 9:00 A.M. Central Standard Time (CST) on November 23, 2018 and ends at 5:00 P.M. CST on December 23, 2018. Who’s Sponsor: The Sponsor of this Sweepstakes is General Mills Sales, Inc. One General Mills Boulevard Minneapolis, MN 55440.